Hi my friends! I tried something new today with my Sepia Scenes post. I experimented with Curves in Adobe Photoshop 7 and went for that bronzy, burnt look. I like it! Hi Mary - the brozny look is perfect for those umbrellas! I have transitioned my blog - formerly "It'a A Blog Eat Blog World" into "The Mo Files"
One of the things that I didn't want to give up by cutting back on blogging was "Sepia Scenes" and today is a picture I took that I've turned into a greeting card on Etsy - and it was featured in a Treasury collection there today! Hope you're enjoying the start to summer! The sepia tone reminds me of the beach, on the ground and in the umbrella, too. Nice effects of Summer! love its editing! perfect for the summer! It makes the red of the umbrella look really warm, as in a hot day. I'd like to see more done in this technique. A perfect photo in summertime. Love it! I like it very well. Cool. Great editing. 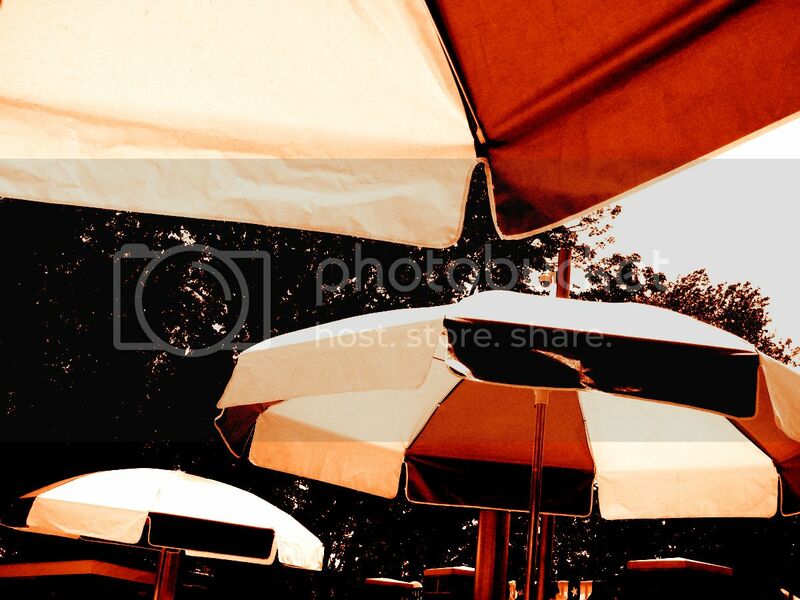 I lIke the Panera bread balancing shot and the bronzy look of the umbrella photo. A perfect Summer shot in sepia, I love it! what a really nice photo.perfect. That was very interesting colors! make me think of the 50th :) .... wonder why? Very modern looking. Sepia to me conveys a old time nostalgic look. The umbrellas look good, I think so to!